Hello friends! I needed a masculine birthday card, so I thought it would be fun to haul out some of Waltzingmouse's Woodgrain images. I find that I always have feminine cards on hand, but never masculine. They are definitely harder to make if you like to embellish, that's for sure. I stamped the background panel with the Woodgrain background, then embossed it with a woodgrained embossing folder to give it some texture. I then layered a couple of woodgrain banners over it after diecutting a frame using the new Stitched Rectangle die (Waltzingmouse). I then took the Zig Zag Backgrounder image, stamped it with Night Sky (VersaMagic) onto Kraft Cardstock, and diecut it using a Star die (Spellbinders). 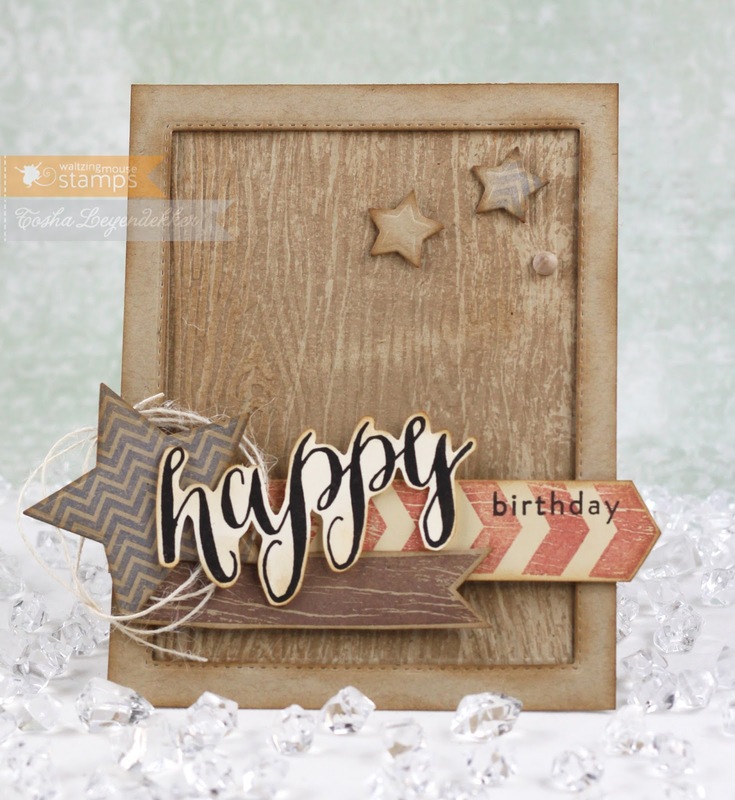 Lastly I added the "birthday" sentiment from Hello, Happy Thanks (Waltzingmouse) to the arrow banner and free-hand cut out "Happy" that I stamped onto vintage Cream cs (PTI). That's about it. Thank you so much for dropping by! I hope you have a FANTASTIC week! !